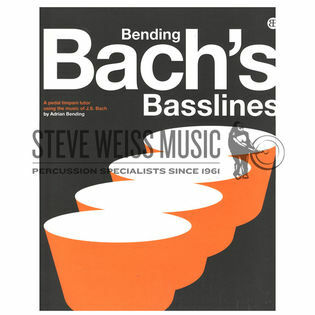 It is a collection of Bach chorales with their basslines specially adapted to be played on timpani. You can play along to the accompanying CD of professional recordings. The book contains 28 Bach chorales, the timpani parts from Bohemian Rhapsody (from We Will Rock You) and No Change by the fantastic jazz percussion ensemble All Bluff and Porterage, and some chapters on general timpani playing. For each chorale I have written three or four different versions of increasing difficulty, ranging from a few downbeats and cadences to playing the full bassline throughout. An easy example has just a few pedal changes. 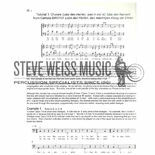 Although the notation shows you how to play the chorales on four timpani, most of them are easily playable on two or three drums and you certainly only need 2 pedal drums for the vast majority of chorales. The last example of each chorale closely replicates the full Bach bassline. From you student to professional, this book with 70-minute CD included provides a huge and ongoing resource for any aspiring timpanist. Click the "watch/listen" tab above to see more about Bending Basslines. This book is just brilliant. It is well thought and has a lot of exercises and ideas to work with. The playback tracks on the CD are very useful and the notation has a good system you will learn to deal with very fast. I can recommend this book to everybody! Any sensible addition to timpani technique material is most welcome, but what's really interesting to me is that through this book students will be alerted to the magnificent musical creation of Bach's cantatas. Through his wide experience of the style Adrian Bending has given us a valuable learning resource for musician timpanists. David Corkhill - Timpanist, English Chamber Orchestra; former Principal Percussion, Philharmonia; Timpani teacher, Guildhall School of Music and Drama; Percussion teacher, Goldsmith's London University. Fun for students and professionals. This is a great book to get students to understand the role timpani play in the orchestra. The exercises provide a musical framework to pedal, sing bass-lines and harmony as well as really listen to how your choice of note sits within the chord. I have enjoyed just playing through it myself as there is great playing and singing on the cd that accompanies the book. I would definitely recommend this fun book for all levels and abilities of timpani and percussion players. Above all, it is a really enjoyable and creative way to sit and play the timps in short or long periods of practice. The book and top-draw recordings strongly encourage the use of musicianship as well as offering solid (and simple!) practical approaches to pedalling. You can easily dip in and out of the book and since there are a handful of progressive stages per chorale bassline it is highly adaptable to the level of player, drums, time and any other variant you might have! I have been looking for a fun and constructive way to practice intonation on the timpani for ages! And there it is: Adrian Bending came up with an incredibly resourceful method, based on Bach's choral works (but not only... there are a few other surprises inside! ), combined with little anecdotes, tips and tricks. Some of them are priceless! A must have, both for students and professional musicians!